You will need 2 players and 1 basketball for this 1 vs. 1 drill. One attacking player stands around the free-throw area while the defending second player starts under the basket with the basketball. The drill starts when the defensive player passes a ball to the attacking player around the free-throw line. The defensive player immediately sprints out to the shooter to close him down. The offensive player immediately shoots as he receives the pass. The offensive player follows his shot in attempt to rebound the ball offensively as the defensive player attempts to position himself for the rebound. Both players attempt to box the other player out in order to receive the rebound. Players should switch roles after each shot. 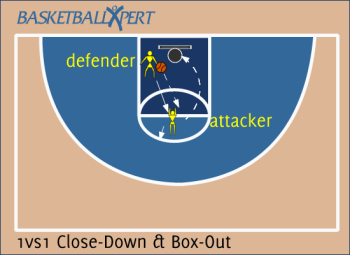 Give the shooter the option to fake a shot and drive to the basket or shoot to keep the defensive player honest when closing down the shooter. To focus on defensive rebounds have the shooter play at 50%. Position self in flight of the ball. Position body to move opponent out of flight of the ball. Explode to rebound and catch at highest point.